Some additional recent stories about the current battle over the Peace Bridge in Buffalo, all from the Buffalo News. I will refer you direct to the links to the stories this time around. Regarding the old "80" posts in Tribes Hill, there are also some other gems in the immediate vicinity to be found. Michael Moroney, a frequent contributor to the Usenet newsgroup misc.transport.road and webmaster of Vermont Roads (among a few other sites), had asked why I didn't post photos of the old New York State Highway signs in the area. I wanted to focus on the cement posts. However, I've decided to post a few extra photos from the area. The aforementioned old signs, with destinations of Auriesville and Fort Hunter (on the other side of the Mohawk River). The Amsterdam and Fond destinations denote that this was an old alignment of NY 5. For some reason, the original lettering was scraped off (these are cast iron signs which originally came with embossed lettering) and then repainted. It's also possible the signs were recreated. Great finds! But I'll raise ya on the old yield sign. The one I found in Saratoga County in 2006 was EMBOSSED. Old Relic State Route Marker? Posting to a blog has many uses. One such use would be to enlist help in trying to identify an old relic. Recently, I was on a drive with Mark Sinsabaugh and Steve Alpert and we decided to check out various road related items of interest in Fort Hunter, NY and Tribes Hill, NY, which are neighboring towns separated by the Mohawk River in Montgomery County. You may have heard of Fort Hunter as it is the town where the Interstate 90 / New York Thruway bridge collapse over the Schoharie Creek occurred in 1987. Upon checking out a few old signs in Tribes Hill, we noticed a few concrete markers that appeared to have a route number or something similar. Tonight's local sign find takes us to Whitesboro, New York, which is a suburb of Utica. There are two signs located on Main St. in Whitesboro, which may have been a former alignment of NY 69, that have an old style feel to them, or may come out looking to be complete bizarre. Mark Sinsabaugh, of New York Routes at Gribblenation pointed out these gems to myself and Steve Alpert of Alps' Roads. First is the Library Crossing sign. This sign, and the corresponding library crossing sign a little ways down the same street, may be the only library crossing signs known to man. This dangerous library crossing sign is for the Dunham Library in Whitesboro. Here's a relic from a bygone era, an old black on white sign directing travelers on NY 69 to continue on to Oriskany and Rome. This sign may be from when NY 69 was re-directed towards its current alignment when NY 291's current southern end was constructed. This past weekend I went down to Charlotte to visit with friends. It was a good trip with a number of photos. The full set of trip photos on flickr is here. I-540, I-40, NC 86, US 70 (which I followed onto Business 85 to its end south of Lexington), I-85, I-485, NC 27. This is US 70 West between Hillsborough and Efland. Over 50 years ago, US 70 West would follow the connector road to a two lane super two freeway. This would eventually become a four lane I-85, followed by I-40 tagging along, and then widened to the nearly 35 mile eight lane I-40/85 freeway we drive on today. A rather humble start don't ya think. I followed US 70 to Greensboro. 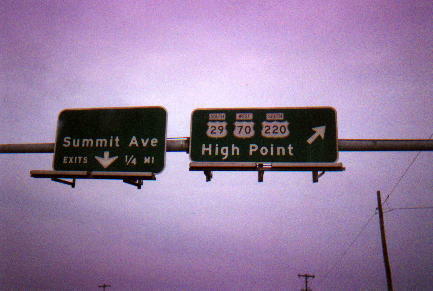 The button copy overheads at where US 70 West meets US 29 that I found in 2000 are no more. The design is similar but the old lighting is also gone. So which SC Shield style do you prefer? We're not the first to show an example of the new SC Highway shield. That honor goes to Alex Nitzman and Justin Cozart. But I finally saw my first new shield on the road this weekend, and amazingly enough, the new shield sits along with an example of the older shield. Taken on SC 274 South in Lake Wylie, SC. Now that everyone has calmed down at the sight of seeing I-73 signed on the recently opened segments of the Greensboro Outer Loop, it's time to get you all excited again! Yep, you guessed it. More I-73 Photos! A few weeks ago Bob Malme sent me three shots showing other ways I-73 is signed on the freeways and surface streets that interchange with I-40/73. Here Bob is on Wendover Ave. and I-73 is marked on the overhead signs. It will be interesting to see what will be listed under Winston-Salem as the Greensboro Loop and I-73 is built. Martinsville, maybe? Again on Wendover, here's a look at stand alone I-40 and I-73 shields. If you aren't a fan of I-73....get used to it. It's here to stay. Now some have stated that I-40/73/85 form one of the few triplex Interstate segments in the country. And hell, the state even signs it that way. As Bob Malme noted in the comments section of the recent toll post on the Triangle Expressway, there may be a solution to the funding gap problems for various NC Turnpike Authority projects. The 21st Century Transportation Committee released their official plans on ways to improve funding and building highways. The key part of the proposal is the elimination of the controversial annual $172 million transfer of money from the Highway Trust Fund to the General Fund. This transfer of funds, written into the legislature over 10 years ago, has come under scrutiny as numerous construction projects have become delayed throughout the state. In particular, the Committee suggests that $75 million of the money go to the NCTA to help with gap funding. This would pretty much give the green light to the Triangle Expressway, Mid-Currituck Bridge and other proposed toll projects. This morning's blog post has much to do with happenings around Buffalo, New York and Fort Erie, Ontario. The neverending saga of the replacement or the expansion of the Peace Bridge that links the two municipalities over the Niagara River continues. This time, it's gone to the birds... literally. The Buffalo News reports that the signature span that was selected was rejected by federal agencies because it may impact the flight patterns of migrating birds. The towers of the cable-stayed bridge design, which actually would be taller than the Washington Monument, apparently have the capability of confusing the birds and knocking them dead in their tracks. According to a recent article in Toll Road News, the North Carolina Turnpike Authority has announced a 13.5 cents per mile toll rate on the yet to be built 19 mile Triangle Expressway. The toll rates are listed for electronic cashless transponders (like EZ-Pass) which will be the primary source of collection on the proposed toll road. According to a recent tidbit in the Cumberland (MD) Times-News; the remainder of the 14.3 mile Moorefield to Forman section of Corridor H is on track to open in the Fall of 2009. The brief story includes two photos of an under construction overpass. We took a weekend to the mountains...staying overnight in Blowing Rock and then spending the day exploring the area. For the entire photo set on flickr...go here. What started out as a gorgeous day in Raleigh turned into a foggy, rainy, and later stormy evening in the Mountains. The rain started just west of North Wilkesboro, the fog really kicked in on the ascent up the Blue Ridge to Deep Gap and stuck around the rest of the day. Oddly, the fog lifted as the night went on. We made a quick stop in Burlington and went through downtown Graham. There's quite a few older wall advertisements and billboards in town. It's certainly worth a return visit for more photos. Sunday Morning we spent sometime along the Blue Ridge Parkway before heading to the Mast General Store in Valle Crucis. Our first Parkway Overlook was at the Thunder Hill Overlook just north and east of Blowing Rock. They don't call it the Blue Ridge Mountains for nothing. Street signs on an Interstate? No way!